Outside his career in music, Dickinson is well known for his wide variety of other pursuits. 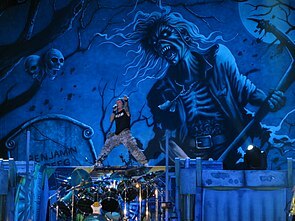 Most notably, he undertook a career as a commercial pilot for Astraeus Airlines, which led to a number of media-reported ventures such as captaining Iron Maiden's converted charter aeroplane, Ed Force One, during their world tours. Following Astraeus' closure, he created his own aircraft maintenance and pilot training company in 2012, Cardiff Aviation. Dickinson presented his own radio show on BBC Radio 6 Music from 2002 to 2010, and has also hosted television documentaries, authored novels and film scripts, created a successful beer with Robinsons Brewery and competed at fencing internationally. 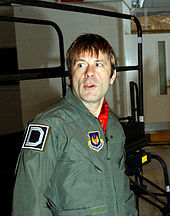 In 2019, Bruce Dickinson was made an honorary citizen of Sarajevo and received the city's prestigious Sixth April Award for his efforts in performing under siege in 1994. According to the city's mayor, it was his arrival in Sarajevo that "was one of those moments that made us...realize that we will survive, that the city of Sarajevo will survive, that Bosnia and Herzegovina will survive". Dickinson is also credited as a producer on the critically acclaimed 2017 documentary "Scream for Me Sarajevo", which chronicles this performance and his return to Sarajevo. 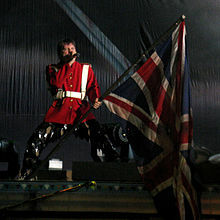 Dickinson presented Bruce Dickinson's Friday Rock Show on BBC radio station 6 Music from 2002 to 2010. In March 2010, the BBC announced that, after over eight years, Dickinson's show was to be axed. 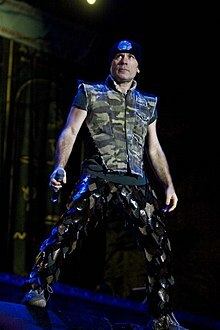 His final broadcast was on 28 May 2010, with the regular format abandoned in favour of a personal and musical tribute to the recently deceased Ronnie James Dio. Dickinson scorned the BBC executives for the cancellation, playing the Johnny Paycheck version of "Take This Job and Shove It". In addition to his show on 6 Music, Dickinson also hosted a series entitled Masters of Rock on BBC Radio 2 from 2003 to 2007. Dickinson's catalogue of 6 Music programmes were acquired in 2014 by TeamRock radio, who began re-broadcasting episodes in December. This page was last edited on 23 April 2019, at 17:25 (UTC).